Mobilarian classification groups based on forum contributions. Mobi Shop is an added privilege or extra treat for members who continue to contribute even after gaining Contributor status. 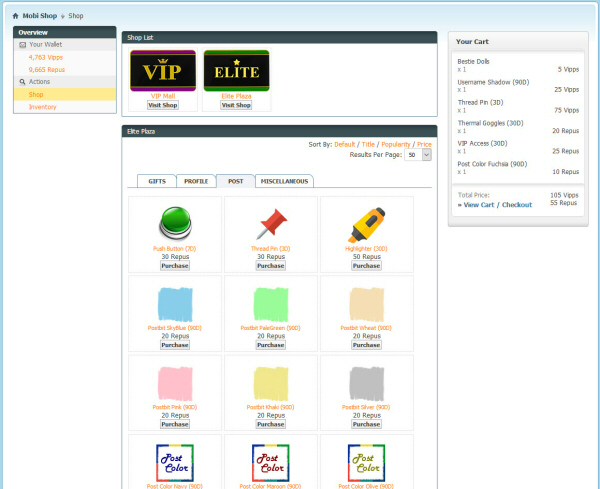 Virtual gifts and forum enhancement items can be purchased in the Mobi Shop. Currently there are 2 kinds of shops, the VIP Mall and the Elite Plaza. Both shops offer same items but differ in the currency they accept. 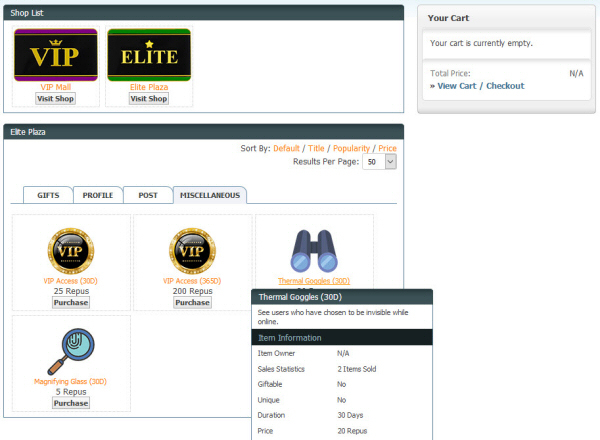 We've provided some screenshots below to give you an idea what the shops look like. VIP Mall is available to Mobilarian VIP members, and will only accept Vipps as payment. Those who made a donation will receive an equivalent amount of Vipps which they can use to purchase items in the VIP Mall. Elite Plaza is available to Silver Contributors, Gold Contributors and Hall of Fame members only, and will accept Repus as payment. Repus is equivalent to reputation points. If Repus are spent, reputation points will decrease. Just continue sharing, helping and posting useful stuff to gain more reputation points.